Finnhomy, the professional furniture supplier, now provides a great variety of excellent furniture. With the combination of global intelligence, high quality material, reliable performance, and world class design, Finnhomy keeps bringing best furniture to customers all over the world! 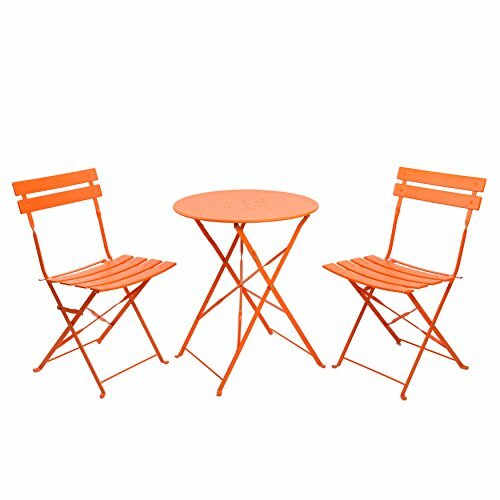 Folding table and chair set includes: one round table and two chairs with safe lock. Table: 23.5L X 23.5W X 28H inch Chair: 16.5L X 18W X 32H inch. Made from 100% metal, and rust-resistant with powder coating and withstand the outdoors, even coastal living. Strong, durable and elegantly designed, chairs support up to 280lbs respectively,no assembly required, comes ready to use. Maintenance free, simply clean with a hose and mild cleanser, Environmental friendly. If you have any questions about this product by Finnhomy, contact us by completing and submitting the form below. If you are looking for a specif part number, please include it with your message.